“It’s only a matter of time until we’re going to probably end up with a symbolic number fo herders, and that’s it,” said Quentin Moreau, country director for Czech NGO People in Need. Gantumur rides a stocky white horse out onto the steppe, a choppy trot moving toward two dots in the dry grass. He dismounts next to a sheep and lamb. They have barely moved from this place since the birth 10 days ago, the mother too weak to walk. Gantumur, a 51-year-old Mongolian herder, spreads a plastic bag on the ground, offering its contents of bran to the sheep. As she eats, he sits next to his horse, using the animal for protection against a bitter wind that ruffles his knee-length deel overcoat, its thick blue cloth flecked with horse hair. "I'm bringing food so she can gain enough strength to rejoin the herd," he says. But even with the additional sustenance, he worries about the mother, her wool falling in clumps off a thin body. "She's so weak – and if she can't make enough milk, both of them will die," says Gantumur, who like many Mongolians goes by only one name. 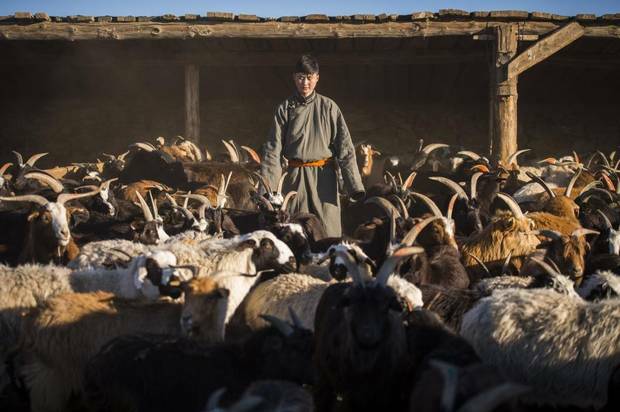 He has already lost 60 of his 100 goats and sheep, after a fierce winter that has taken a grim toll on the Mongolian steppe. The spectacular expanse of undulating grassland has long sustained the country, but has come under threat from climate change and overuse, which in recent years has killed huge numbers of animals and propelled a human exodus from the land that is eroding one of the last nomadic cultures on Earth. 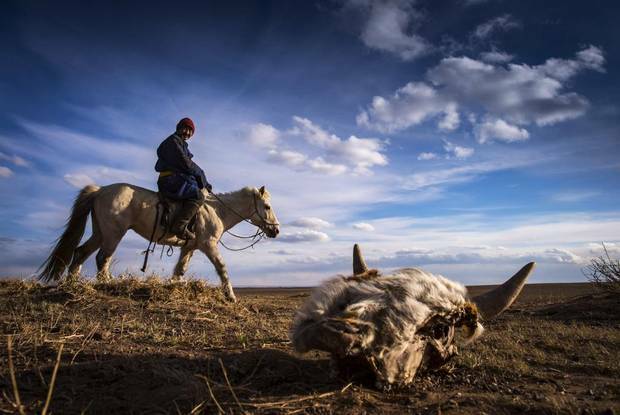 Gantumur, a 51-year-old Mongolian herder, rides past a dead cow near Adaatsag, Mongolia April 16, 2016. Gantumur has already lost 60 of his 100 goats and sheep, after a fierce winter that has taken a grim toll on the Mongolian steppe. 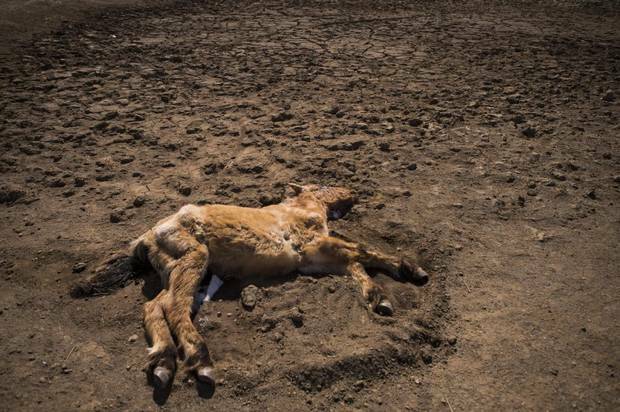 Across Mongolia, nearly 860,000 animals have already died from this year's dzud, a weather phenomenon in which a summer of drought is followed by a winter of cold and heavy snow. Today, carcasses lie in dry gulches and dried-out watering holes, their exposed skin gleaming in the sun after herders stripped hides to salvage some value. Many more animals died from large numbers of miscarriages. The dzud is part of the Mongolian landscape. Elder herders recall great numbers of livestock felled by dzud conditions in 1945 and 1967. But what once took place on a lengthy cycle now appears to be coming with more frequency. Huge numbers of animals died in 2001, and then again in 2009, before this year's dzud – which although regional and not as deadly as earlier iterations, is still expected to kill more than a million livestock. "It used to happen every 20 years. Then it went to a 10-year pattern. And now it seems we have come to a five-year pattern," said Quentin Moreau, country director for People in Need, a Czech disaster response organization. "It's very likely an aggravating factor is climate change." Driven in part by the emotional toll of losing animals under their care, herders themselves are abandoning the steppe. 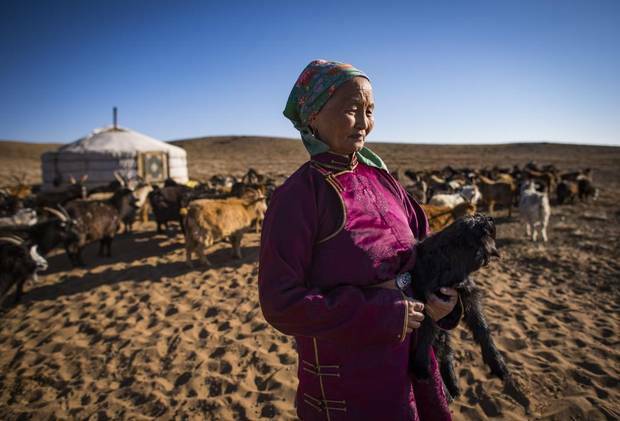 Between 2010 and 2015, the number of Mongolian herders fell from a half-million to 300,000. 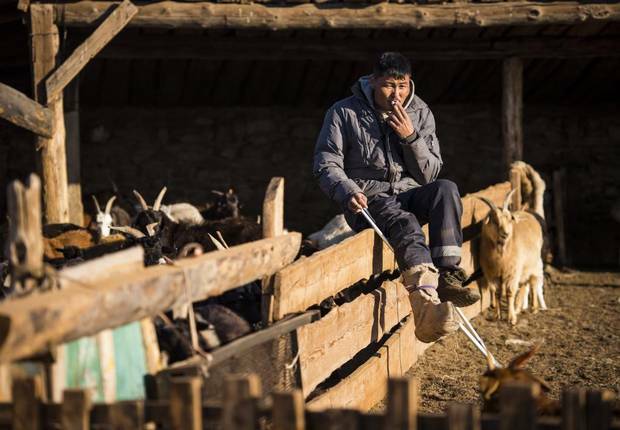 Mongolia's herder culture, one of the last on Earth, is "just dying. It's only a matter of time until we're going to probably end up with a symbolic number of herders, and that's it," Mr. Moreau said. Dusmaa, 64, lives just outside Adaatsag lost more than 100 livestock this past winter. The family bought additional hay and feed, and did what it could to save animal lives. But winter punished humans animals alike. In Adaatsag soum, a county-like region in southern Dundgobi province, 15 per cent of the population has vanished in the past three years alone. Local leaders have tried to stem the departures, organizing training sessions and seminars to promote the herder lifestyle to young people. The message is: "You don't have to go – you can stay here and you can live well in this soum," said Ochirbat, the elected leader of a local bag, or brigade, a smaller administrative unit. "We are doing this because Mongolia has been founded on animal husbandry. It's the main economic pillar of the country. That's why we need to keep younger generations in the countryside to tend livestock." But it's been a hard battle, particularly as dzud conditions kill animals owned by young herders who may struggle to shepherd them through tough conditions. A half-decade after the last major dzud, some herders have recovered only a fraction of their former herd sizes. Others have already quit. "They sort of give up. They don't have the mental or psychological power to continue herding livestock," Ochirbat said. "They feel that 'I can't do it so I would rather go to the city.'" In 2014, only 29 per cent of Mongolians remained rural, according to World Bank statistics. In China, by comparison, nearly one in two people still lives in rural areas. But Mongolia's transition to an urban population comes amid worsening conditions on its vast grasslands – which sprawl across a country larger than Quebec – that have only grown worse as people have left. 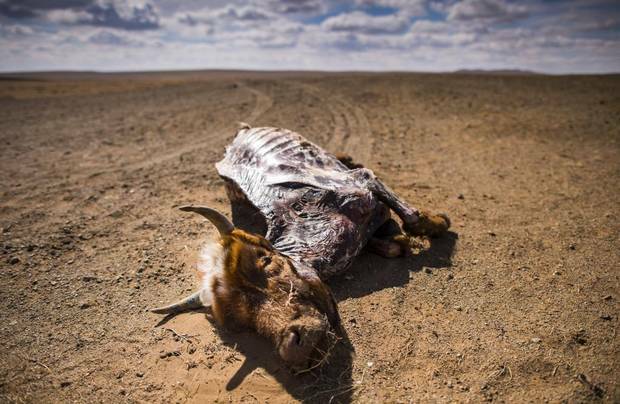 Across Mongolia, nearly 860,000 animals have already died from this year’s dzud, a weather phenomenon where a summer of drought is followed by a winter of cold and heavy snow. Today, carcasses lie in dry gulches and dried-out watering holes. Many herders are only partly quitting the countryside, becoming instead absentee herders who live in the city but maintain hundreds of animals in the countryside to augment income. That has created larger accumulations of animals, and with it, bigger problems. Some herds now exceed 1,000, as families care for their own animals alongside those owned from afar. Mongolia now has 61 million head of livestock, roughly double what scientists believe the country's natural environment can support. At the same time, herders who once regularly moved long distances have grown more sedentary, a product of bureaucracy and growing material possessions. The grasslands may remain unfenced, but administrative divisions imposed during Soviet times, and since maintained, have bound the landscape in ways that interfere with old patterns. A study by Batbuyan, a human geographer at the Mongolian Academy of Sciences, found that 154 out of 330 soums lacked one or more seasonal grazing areas. Solar panels, meanwhile, have brought modernity to remote places, but at the cost of mobility. In older times, herders kept possessions to what could move on two camels, or four horses. Today, it takes a truck to haul around flat-panel televisions and DC-power washing machines. Many herders move once a year rather than with the seasons, and often only short distances, creating an increasingly heavy footprint on the grasslands. "People with big animal herds cannot move far, and so they just hope there will be rain and there will be grass," Batbuyan said. The solution, he says, lies both in returning to past practices – including moving with each season – and in embracing new solutions. That can include building co-operatives to help spread herds across the landscape. By working together, herders can embrace modern practices such as the ability to trace meat to its source, which in turn can help boost exports, raise meat prices and lessen the need for such large numbers of livestock. A summer of drought followed by a winter of bitter cold and heavy snow left Dusmaa and her herding family in dire straights. Dusmaa’s son, Munkherdene, broke his leg in a motorcycle accident and could not work. The family lost more than 100 livestock thanks to the extreme weather. The alternative is increasing fragility in the face of a landscape in the midst of damaging change – some of it natural, some of it caused by humans. Climate projections suggest Mongolia will see more warming than any other East Asian country, with average temperatures increasing more than five degrees by 2090. Precipitation patterns are already changing. Hundreds of rivers and lakes have already gone dry. At the same time, illegal hunting, much of it for sales to China, has eliminated roughly 75 per cent of the country's marmots, a species important in maintaining grasslands health, in the past two decades. Today, "over 70 per cent of the land has been influenced by desertification – not just the steppe, but even in mountain areas, because of climate change and the impact of livestock," said Suvd, an Ulaanbaatar-based project officer with GIZ, the German international development agency. In Dundgobi, or Middle Gobi, the province on the northern fringe of the Gobi Desert, countless miniature sand dunes gather around tufts of grass. Less than 1 per cent of the province is unaffected by desertification; the encroachment of sand is considered "medium" or "very strong" in nearly three-quarters of its land. Outside Adaatsag, a recent windstorm blew in a sand drift more than half-a-metre thick, nearly burying a large metal milk jug behind the stone-walled shelter for sheep and goats that belongs to Dusmaa, 64, and her herding family. "I'm worried that the sand is increasing," she says. They lost more than 100 livestock in the recent dzud. Thirteen dead goats still lie on a nearby roof, waiting for the family to find time to strip away their valuable cashmere with hot water. "The winter was harsh," Dusmaa says. "It was much colder than previous years," with temperatures dipping to -40 degrees Celsius, "and the snow cover was thick." Munkherdene’s nephew Sukhbat, 15, helps out on weekends. The family bought additional hay and feed, and did what it could to save animal lives. But winter punished humans and animals alike. Dusmaa's son broke his shin after crashing his motorcycle on the icy ground, leaving him on crutches and unable to work for six months. Even warmer April temperatures are small consolation. "Until June, we are not completely out of danger," Dusmaa says. "A sudden snowstorm can make things difficult." As she talks, her daughter-in-law places a giant steel bowl on the stove in the centre of the family ger, the round structure, insulated with lamb wool felt, commonly known as a yurt. She pours in milk and tea leaves to boil up milk tea. The family hands around a plate stacked high with dried curds, bread and hardened milk fat, all made by hand. Outside, workers use tools with bent steel tines to scrape cashmere from goats. Falcons and camels dot the surrounding landscape. Dusmaa knows she is part of a diminishing way of life. Three of her six children are no longer herders; even those still tending livestock send their children eight kilometres away to live in the dusty local village on weekdays to attend school. The primary ambition for many herders is to give their children a future away from the grasslands. "When I look at people who have gone to get jobs and make a small salary, I feel for them. I think they would be better off herding livestock instead," she says. "All of our needs can be met from our livestock – the milk, the wool, the cashmere," she says. That's not to mention the cow and sheep dung that provide valuable fuel for winter heat. Dusmaa admits it's tough when dzud conditions hit. "But when nature is great, and the weather is okay, we have no problems. It's really great to have livestock."